Good day everyone! I recently had the opportunity to work with Tostadora. Tostadora is a website where you get either your own or someone else's geeky design printed onto a wide range of products, included, tote bags, t-shirts, hoodies and phone cases. Even children's clothes! I had the chance to browse through their thousands of user and designer made designer to put onto a t-shirt. You can even choose the colour! I chose this shirt. It is called 'Link's Purest Stuff' and is a crossover between The Legend of Zelda and Breaking Bad. 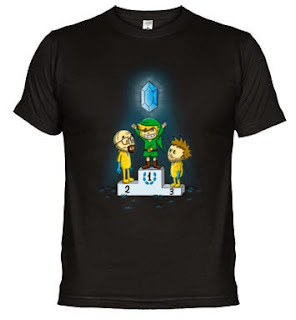 It features Walter White and Jesse Pinkman on the 2nd and 3rd positions on a podium respectively with Link standing at 1st places. Link is holding up a blue rupee and looks extremely happy with himself whilst Walter and Jesse looking at him completely heartbroken because of their jealousy towards his ultra-blue rupee which is more pure than their Blue Crystal. The shirt is amazing, just look at it! Not only is the design great but the quality of the shirt a good aswell. Usually with geeky shirts the creators spend all of the money on the design but cheap out on a really crappy and uncomfortable shirt. But Tostadora's shirts are incredibly soft and comfortable. Really high quality which you can tell as soon as you put it on, I've only had a couple of week but I've already worn in more than I should. (Cleaning it as well of course). Tostadora have a wide range of design ranging from Star Wars to Game of Thrones and much more, I really do recommend their shirts due to their high quality and the low price of them too. I do indeed plan to buy more because I saw loads more designs that I liked.